The story of the Grand Championship Grand Prix for 2018 can be told with the top two scores of April (as well as the eleventh and twelfth highest scores of the month)! The top score of the month, and the top score at Farside for April, goes to a familiar team in a new location, with the Cunning Stunts scoring 169 points at the April 18th edition of Trivia Club at Farside! This was the GCGP VI night at our Friendly Neighborhood VHS loving location, a week after winning at The Ace for the sixth highest score of April 2018 (also making them the only team to make multiple appearances on this list)! This brought the Cunning Stunts within just a couple of GPP of the Fighting Mongooses, forcing them to go two out of three in the final two nights of competition if they wanted to retain the Golden VCR! 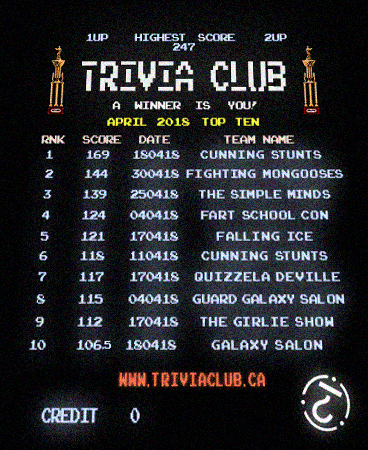 The top score at Hitch for April, and second highest score of month, belongs to the team that would solidify there seat in Trivia Club history as the NEW Golden VCR Grand Champions, The Fighting Mongooses! They scored 144 points on April 30th, a new personal best for the Grand Champions on the last day of the month and the GCGP Finale for 2018! On that night they not only took home the Golden VHS but also the Golden VCR! The Fighting Mongooses would also have the eleventh and twelfth highest scores of the month, with plus one hundred finishes at Hitch on the opening event of the GCGP on April 9th, and at The Ace on April 11th! The highest score of April 2018 at The Ace and third highest score of the month belongs to The Simple Minds for their Golden VHS winning 139 points on April 25th! The highest score of April 2018 at The Rec Room and fifth highest score of the month belongs to Falling Ice, who won the Golden VHS on the night with 121 points, also on a night when the front entrance had been shutdown due to ice falling from the CN Tower! The highest score for a team that did not win the Golden VHS that night belongs to the competition to Falling Ice on that same night at The Rec Room, Quizzela DeVille, who lost by just four points! It should be noted that Guardians of the Galaxy Salon (also known as Tiny Tim's... at past Trivia Club events), who lost to Fart School Confidential (also known as the M. Night Shaym-Aliens) at Farside on April 4th, but still attained the eighth highest score of April, and Galaxy Salon who lost to the Cunning Stunts two weeks later at Farside on the 18th (and who finishes on the scoreboard just a half a point ahead of the eleventh highest score of the month), are different teams who just both happened to be inspired by the same Chinatown East neighbourhood establishment. This is the fourth consecutive appearance for the Fighting Mongooses on a Monthly Scoreboard, making them now four for four in 2018. It is also the second straight appearance for The Simple Minds, making them two for two in the history of Trivia Club at The Ace! Teams competing at Farside appear the most on this month's Top Ten with four appearance, while teams at The Rec Room (specifically the 17th of April during Ice Week) make three appearances, The Ace make two appearances, and Hitch's newest Grand Championship competition is the sole appearance this month for our longest-running current location. The Mean Team for April, the team with the high score closest to the scoreboard average, is... the M. Night Shaym-Aliens' Fart School Confidential! Support Trivia Club on Patreon! Russel Harder hosts Trivia Club at Hitch (1216 Queen St East) every MONDAY, at The Rec Room (255 Bremner Blvd) every TUESDAY, every 1st & 3rd WEDNESDAY at Farside, and every 2nd & 4th WEDNESDAY at The Ace! Every FRIDAY, a new episode of the Pause & Play podcast (a portable version of our live events) is available on SoundCloud & iTunes!